With the tech world awash with rumours about the iPhone 5C, iWatch, and Apple iTV, a new product is hoping to tap into the steady stream of coverage Apple is getting at the moment. Called the iTap, this peripheral looks to be perfect for those whose love for Apple runs both hot and cold. 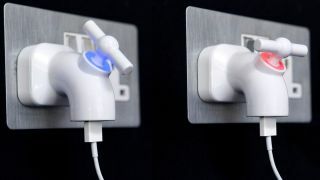 All right, you've got us: it's just a charging plug shaped like a tap. But it's just the sort of thing Jony Ive would design if he hadn't sold his soul to the Bauhaus movement.